3D Issue’s Digital Magazine Software allows you to create professional digital publications which can be viewed on desktop, tablet, and mobile devices. Our flipbooks are created from PDF’s and are completely flash free! 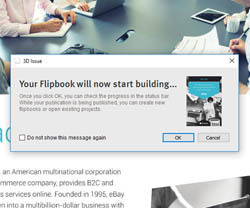 In the latest release of our digital magazine software, FlipBooks V9, we focused on improving the mobile experience for the user. In version 9, we added features guaranteed to offer an enhanced experience on mobile devices. One core feature in our latest software update was our separate uploader. FlipBooks V9 creates an additional unique version of each publication, specifically for mobile readers. Now that the software creates two versions of the same publication, one for larger screen readers and one for mobile, it also increases the time it takes to upload given that we are now uploading two versions of every publication. We recognised that this could impact the users experience and quickly came up with a solution. 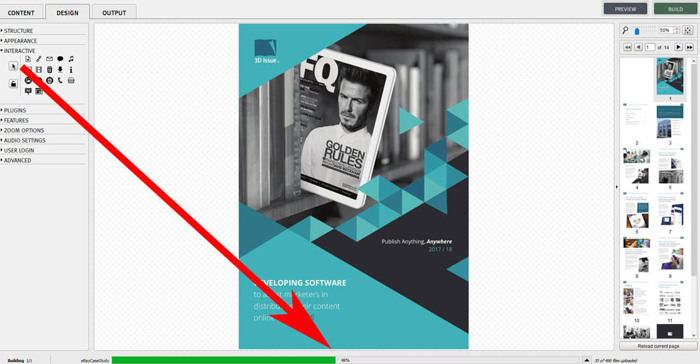 In the previous version of the digital magazine software, once you were satisfied with your magazine and ready to publish, you needed to wait until the magazine had finished converting and uploading before you could continue using the software. With the new enhancements, now creating two versions, the loading time was going to be increased therefore it was time to consider redesigning the conversion and uploading part of the software. We placed the conversion and uploading sequence to a background process meaning that whenever you click ‘build’ on your publication, it is then pushed to a separate ‘program’ that looks after the conversion and uploading. So, what does this mean exactly? Well, you can now continue to create and build more publications without having to wait for the conversion and uploading process! We created our new separated uploader so that our customers could continue working on other publications while one is uploading in our separate program. Time is very much of the essence and in today’s digital age, we have very high expectations regarding loading time therefore its importance should not be overlooked. Take google for example, google uses page load time in algorithms that determine search engine rankings. At 3D Issue our team work very hard to provide our customers with the best digital magazine software experience. With each new release, we focus on the needs of our clients while heavily concentrating on the future of the digital publishing world. Our version 8 release saw flash removed from the software and the introduction of a HTML5 solution that offered the same user experience. With no Flash required, you don’t have to worry about your magazines being blocked by browsers on desktop, mobile or tablet. This release was the first HTML5 solution on the market to provide vectorize text in its digital editions. In our latest update, Version 9, we recognised how important it is to adapt and optimize for the mobile market. We decided that the software should create 2 versions of the same publication. One for readers using larger screens and one for mobile. We also changed how the magazines are rendered on the different devices, without impacting the user’s experience, from their perspective, the outputted magazines would look exactly the same. This led us to creating our separate uploader moving the conversion and uploading sequence to a background process. The production of the magazine is now done by a separate program which runs in the background. The user can continue creating magazines on 3D Issue while the publication is being built and uploaded. Don’t just take our word for it, try Version 9 for yourself it works on both Mac and Windows.